Have you ever needed help? Lots of help? There’s no way you can do this alone help? Well, that’s what Ozzy needs. He has a big mystery to solve; a mystery that has affected his whole life, and he needs help. He doesn’t know who to turn to until he sees an ad in the newspaper for a wizard for hire. Of course, this is the job for a wizard! Ozzy calls him, and that call begins the start of an answer-finding quest. 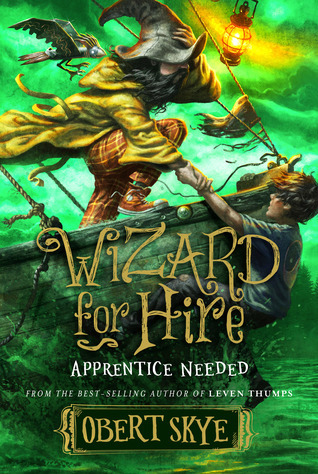 Find out more in my book review of Wizard for Hire by Obert Skye. 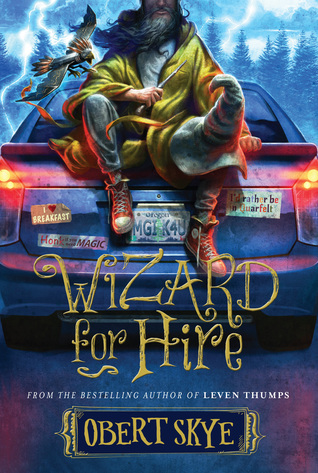 “Fourteen-year-old Ozzy is desperate to find his parents, but he’s not so sure about that ad. . . . He’s read about wizards in books like Harry Potter, but they couldn’t actually exist in the world today, could they? Enter Labyrinth, aka ‘Rin,’ who dresses the part. Sort of. His bathrobe high top tennis shoes seem unorthodox. At least Rin acts like a wizard, but Ozzy has his doubts. Do real wizards write notes on their shoes and eat breakfast for every meal? Most of all, Ozzy just wants to know if Rin can cast any magic spells. First, Brandon Dorman has outdone himself again! That cover art is awesome, right? Seriously. I love the cover art! As soon as I saw the cover I had to read the book. Yes, I totally judge books by their covers (Shhhh! Don’t tell!). The image was idyllic–a mother and father with their small child on the porch steps of a quaint mountain cabin. There were city families that would have paid good money to have their pictures taken in such a scene–a family portrait they could show to their friends as proof of how close they were to nature and each other. For the Toffy’s, however, it wasn’t an act–it was their life. They were safe and hidden away from something of which Ozzy was completely unaware. Things change quickly, however. Their ideal life changes in an instant. What happens next will keep you reading and reading because you have to know what happens. This is a mother’s worst nightmare! Ozzy is a great character. He has a great voice, and he’s one tough, brave kiddo. I love his independence, his ingenuity, his curiosity, and his will to live. Enter the wizard. Or is he? That’s part of the mystery with this book. You see hints of greatness at times, and huge shortcomings at other times. He’s a fun character, though. His eccentricities make you laugh and scratch your head. Half the time you think it’s possible that he’s a wizard, and the other half you just think he’s crazy. He doesn’t come into the book right away, but when he does, he brings craziness with him. Part of the fun of this book is trying to figure out if Rin really is a wizard. And what should Ozzy do if Rin’s just making it up? This book is so fun, I liked it a lot. There’s a hint of sci-fi, and maybe some fantasy? Ozzy makes up for seven boring years by having all sorts of crazy adventures within a short period. Some of them are a little far-fetched, but then again, with a wizard on your side are they really that implausible? I loved the parts where he began learning about the world outside his forest. Ozzy’s sidekick is hilarious too! I liked Obert Skye’s writing style. It’s easy to read and understand, it flows well, and it’s highly entertaining. His descriptions are well crafted, and the characters are well developed and likable. I thought the ending could have used a few more pages, but that’s a small thing. One other thing I liked were Rin’s words of wisdom throughout the book. So funny! Look, you two, I know it appears as if we have unwittingly found ourselves on a great adventure, but it’s important to know that this adventure started years ago. We are just now playing out the plot. Little things that were said, little things that were done—all those things, both granular and grand, shaped the choices and consequences that have led right here.